A useful set of saucepans, the ProCook Gourmet Stainless Steel set of 4 saucepans includes a 14cm, 16cm, 18cm and 20cm saucepans with 1.1L, 1.7L, 2.4L and 3.3L capacities making them ideal for boiling potatoes, simmering vegetables or cooking pasta or pretty much anything else that takes your fancy! With a useful strain & pour design they incorporate pouring lips on both sides of the pan so you can pour easily, making them suitable for both left and right-handers. What's more they feature toughened heat resistant glass lids with steel rims with large and small draining holes to safely drain contents. This cookware is built to offer incredible strength and versatility at amazingly low prices. 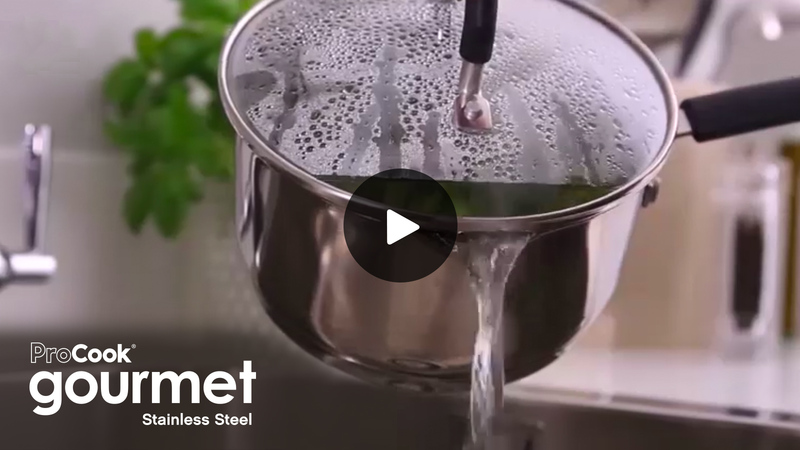 Made from highest quality 18/10 stainless steel the pans have a 4mm encapsulated base for even heat distribution and perfect cooking results. Each pan features stay-cool silicone handles which are riveted for extra strength. Pans are brilliant to use, great on induction hob, look good and are very easy to clean. Really can’t fault their design, easy drainage and cool handles. Amazing value. Very high quality, well constructed and a pleasure to use. I just love shiny things.